An LAUSD budget committee discussing the unlikely possibility of establishing an all-charter school district today found merit nonetheless in seeking waivers from state rules that grant charters a greater degree of autonomy than traditional schools have. 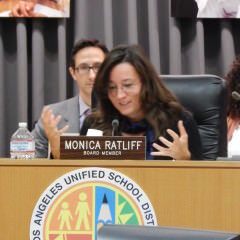 Mónica Ratliff, chair of the Budget, Facilities and Audit Committee, said that it didn’t seem fair that the charter schools did not have to deal with the same rules and regulations that govern others schools. But, the reason that the idea was brought up was that there are autonomies available to charter schools that the district schools cannot access, and there may be ways to get those autonomies through state waivers to the traditional public schools. Ratliff said, “There are a lot of acrobatics to go through.” Then, she added that maybe charter schools can help them figure it all out. School board member Richard Vladovic said, “The reason why I brought the idea up was not talking about changing our contract; I was trying to figure out a way that we not be under so many rules.” He said he wanted to figure out how to expand benefits that the district’s charter schools also get to help greater numbers of students. Yet, Vladovic did imagine that if the entire district became charter in “our wildest dream” he could see that LAUSD could meet the requirements outlined by the state. He said, “I’m trying to figure out why wouldn’t anyone want to do this if it frees us up,” he said, asserting that three-fourths of the state Education Code doesn’t help children. Devora Navera Reed, the district’s associate general counsel, told the committee in her report that more than 50 percent of the teachers of the district would have to approve a charter petition and the district would have to prove it could meet the standards. She said the petition would have to be approved by both the state board of education and the state superintendent of public instruction. As much as Ratliff insisted that they weren’t looking at changing the entire district, she asked questions as if she were considering it. For example, she asked what would happen to the charter schools in the district — they would all come up for renewal together, she was told — and how they would be handled — they would be still under the board’s oversight. Board member Ref Rodriguez, who founded a charter school, said this was a good opportunity to dive deeper into possible waivers the district could ask for, like charters do that. Board member George McKenna asked staff to come back with a detailed explanation of what benefits to instruction the autonomies would provide and report back at the next committee meeting.